Kenjutsu.ie is the digital home of the Dublin Kenyu Bu - a group of dedicated martial artists exploring the koryu traditions of kenjutsu (Japanese Swordsmanship), the core of which is our study of Hyoho Niten Ichi Ryu. On this site you'll find information on legitimate and genuine styles of swordsmanship and the Dublin Kenyu Bu. Here you can learn about kenjutsu and specific styles such as Hyoho Niten Ichi Ryu, the style of Miyamoto Musashi (pictured right), Muso Jikiden Eishin Ryu Iai and Shinto Muso Ryu Jodo. Should you have any questions or wish to study and train in any of these art's please feel free to contact us. 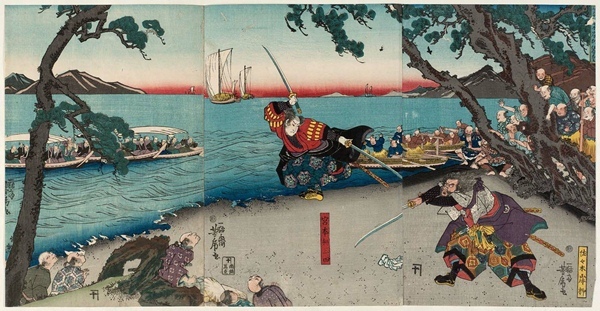 Musō Jikiden Eishin-ryū is, in essence, the art of drawing and using the Japanese Sword. It is a specific style of traditional swordsmanship which trace's their origins back as far as the fifteenth century... learn more about Iai here. Primarily the study of jōdō or jōjutsu, the art of wielding the short staff (jō) to defeat a swordsman in combat this dynamic and exciting style of combat focuses on proper combative distance, timing and concentration.